'Blue Revolution upturns some environmental applecarts - not for the hell of it, but so we can manage our environment better.' 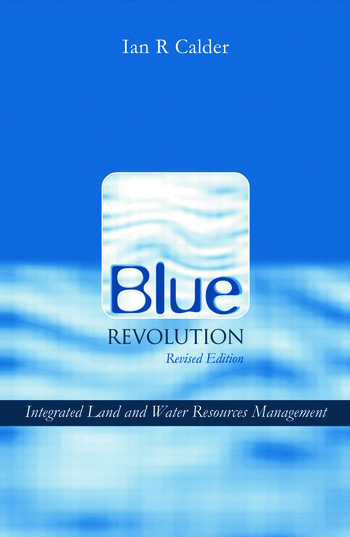 Fred Pearce, New Scientist This updated and revised edition of The Blue Revolution provides further evidence of the need to integrate land management decision-making into the process of integrated water resources management. It presents the key issues involved in finding the balance between the competing demands for land and water: for food and other forms of economic production, for sustaining livelihoods, and for conservation, amenity, recreation and the requirements of the environment. It also advocates the means and methodologies for addressing them. A new chapter, 'Policies, Power and Perversity,' describes the perverse outcomes that can result from present, often myth-based, land and water policies which do not consider these land and water interactions. New research and case studies involving ILWRM concepts are presented for the Panama Canal catchments and in relation to afforestation proposals for the UK Midlands. Ian R Calder is Professor of Land Use and Water Resources Research at the University of Newcastle upon Tyne. He has served as Chief Water Resources Officer in Malawi and as the Hydrology Adviser to the British Overseas Development Administration, now DFID.